I’m back in the USA as of lunchtime today. Some of you may have heard about the big announcement while I was away, but I wanted to put in my two cents anyway. Elon Musk, the co-founder of PayPal and Tesla Motors, posted a 57-page “alpha design” plan on his blog that details how the high-speed train would work. He was referring to the Hyperloop, the new super-speed transport that would take take people from Los Angeles to San Francisco in 30 minutes, at 800 miles an hour. I talked about the announcement of this innovation, that Musk promised on August 13th, a few weeks ago. Musk has been talking about this invention for over a year, in addition to his Space X project which promises to give Earthlings the opportunity to go planet hopping. Apparently, there are still plenty of skeptics who feel Musk is a science fiction writer. Plenty of them took the recent disclosure from Musk as another opportunity to poo poo his ideas. High level executives at other types of transportation companies have a difficult time imagining people being transported through tubes in pods. Well respected engineers question the design, lwhile others say the entire proposed budget of $6 billion is a fantasy. Projects like building bridges or tunnels cost way more than that. A few cited the estimated $68.4 billion that the California High-Speed Rail Authority has budgeted for a high-speed rail. I am not one who believes Musk is smoking something. I have seen too much innovation in the last ten years to question any new concept. I never thought my entire office would be operated from a mobile device, that I would have all of my newspapers and magazines rolled into one flat pancake that is backlit, or that I could type any question in the world into an electronic window and get it answered within seconds. This entry was posted in digital, senior lifestyle, tech and tagged Elon Musk, Hyperloop, Pay Pal, Tesla by loiswhitman. Bookmark the permalink. 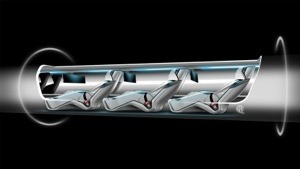 Anyone who has followed Elon Musk and his career from Paypal to Tesla to SpaceX would not question whether the Hyperloop is a real possibility. I had my first ride in a Tesla a few weeks ago and it’s an unbelievable experience. I can see why Tesla owners say that it’s the best car they’ve ever owned and experienced. Many pundits state that Steve Jobs was the Edison of our times. But they may change their minds soon in favor of Elon Musk. I, too, agree that you can’t dismiss anything that Musk has to say. He is a true visionary. You got that right. I have not seen this great of a vision even from top tier companies. Nowadays, everyone just wants to be the Apple of the generation. Must is a different story though. i mean, why doubt when we can have the future now right?